InstaHang is the must have picture hanger that will change your life. 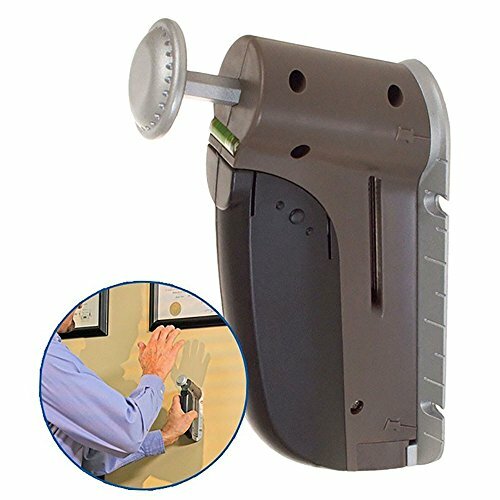 No more dealing with crooked pictures, gaping wall holes, and stubborn nails. 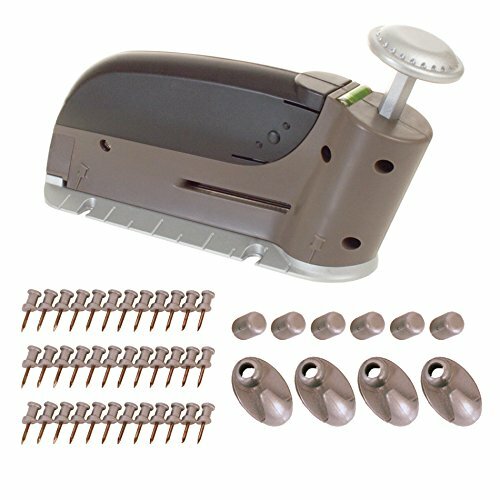 This revolutionary wall peg dispensing tool comes with a 50 piece accessory kit that includes 36 pegs, 8 caps and 6 hooks. Simply, load the peg strip, place flush against the wall and peg. The angled peg design faces up and ensures a super tight grip; you can hang anything from large pictures to wall art or tapestries. InstaHang was constructed for convenience; all accessories fit snuggly inside the tool itself and it even comes with a built in bubble level. Constructed with an auto-reloading mechanism, your pictures will come out nice, clean and straight, every time. This amazing tool prevents the damaging effects from standard household tools and eliminates the need for a clunky hammers and hundreds of nails. InstaHang is the ultimate handymans tool that can be used to decorate, remodel, and simplify your home in a matter of seconds. 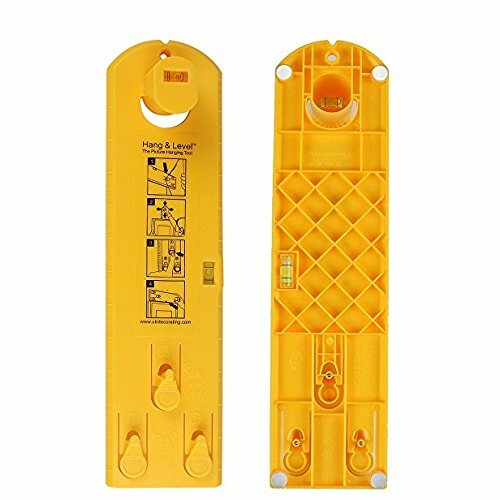 Frame Hanger Easy Wall Hanging Tool Hang & Level Makes Picture Hanging Easy Hang Will be delivered in 5-7 days! Product Description : There's nothing quite like the feeling of walking into a room and seeing rows of photos perfectly aligned on the wall, and sometimes it takes a certain amount of time to get the measurements just right. This time spent on hanging pictures on the wall could've spent on something more meaningful such as your family, friends or hobby's. With the Hang & Level, you can do just that! Hang your pictures in a matter of seconds! It is a tool designed not only to measure and mark exactly where the nail goes but also level the frame after it has been hung. 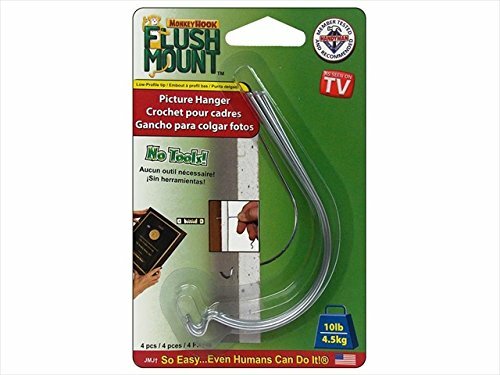 Monkey Hook Picture Hangers enable anyone to hang virtually anything hangable in seconds securely to any wall by hand using no tools. Its the best way to hang pictures mirrors calendars bulletin boards dry erase boards collectibles or any wall decor on drywall. 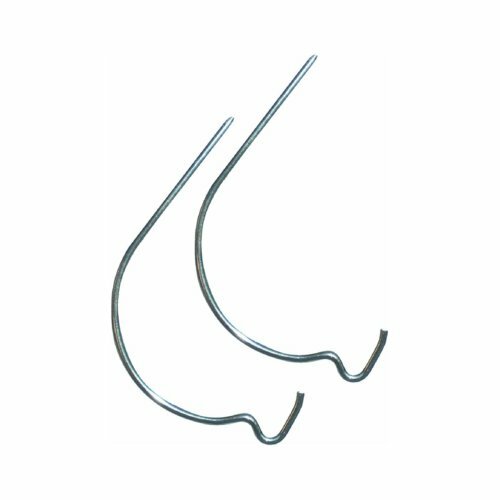 Use these Low profile Silver hooks on 0.5 in. or 58 in. drywall where no stud exists. Holds up to 10lbs.. 4 Pieces.. Pack Of 3.. Item Weight - 0.04 lbs. Enjoy our special sale. 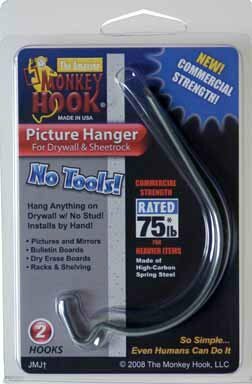 All you have to do is press HelpyHook with your thumb into a drywall to hang a variety of objects. It is that simple! The patented design and material makes HelpyHook special and unique. Winner of 2 prestigious Amazon badges - "Best New Product" & "Amazon's Choice".Can be used as a picture hanger, picture frame hanger, picture frame hanger hook, mirror hanger, wall hook, coat hook, utility hook or household hook for hanging picture frames, photo frames, mirror, key chains, bags, hats, decor items, etc. (our website has lots of pictures & videos of HelpyHook in real-life). Ideal for apartment, home, dorm, office, school, garage, hospiral. ** No nails, no sticking or glueing required. In most cases, requires no tools. If used correctly for the right application, each hook can hold up to 17 lbs. See FAQ on our website for usage pictures and videos, limitations, precautions. Damage free hanging solution. Hooks can be easily removed and re-usable. Leaves almost invisible or very tiny marks for little or no damage to walls (see user reviews). 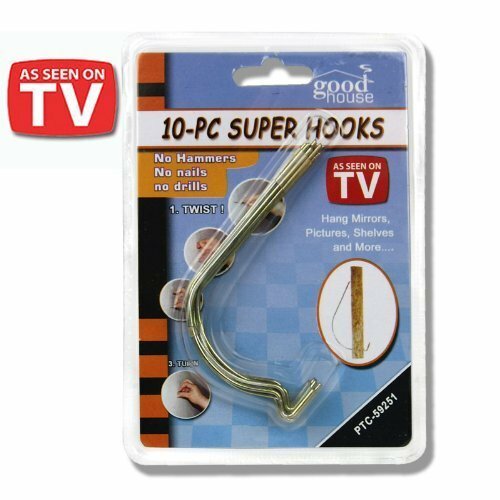 Super Hooks [As Seen On TV] - Pass or Fail? Will these actually hold shelves and mirrors like it claims too? Let's find out on another episode of Pass or Fail? The Grommet team discovers the easy way to hang pictures with the Hang It Perfect picture hanging tool. Compare prices on Picture Hangers As Seen On Tv at ShoppinGent.com – use promo codes and coupons for best offers and deals. Start smart buying with ShoppinGent.com right now and choose your golden price on every purchase.